Drewey Wayne Gunn, professor emeritus of Texas A & M University-Kingsville, made a career of cataloging and examining Gay mysteries, pulps, and drama that were in danger of being forgotten. 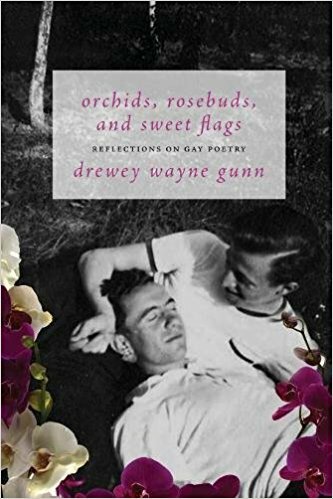 Before he died, he wrote Orchids, Rosebuds, and Sweet Flags: Reflections on Gay Poetry, doing the same thing for poetry, leaving us with a compendium of poetry that we can refer to as Gay, even if it had been written before Gay (as we understand it in the modern sense) became a thing. So what kind of compendium has Gunn left us? At its most basic, his book is a list; and lists are always idiosyncratic, revealing more about the list-maker than anything else, as Gunn acknowledges: “I remind myself that my taste is based on my experiences. They have predisposed me to like certain poems and to dislike others.” Gunn’s taste was, put simply, eclectic: some Great Names from the Canon of Dead White Males appear, but lesser known names, both past and present, can also be found. Of the 83 poets included, 46 wrote originally in English; the rest wrote in Akkadian, Hebrew, Greek, Latin, Italian, Spanish, French, Japanese, Russian, and Slovene. And unlike most academics, Gunn did not disdain writings that were widely known and enjoyed by many people, equating “popular” with “pedestrian” or “lowbrow.” Nor is any topic off limits: subject matter ranges from the downright obscene to the romantic and elegiac. Gunn begins his list ca. 1300-1100 BCE with the Epic of Gilgamesh by Sin-lēqi-unninni, briefly stopping in the Hebrew Bible (the Lament for Saul and Jonathan by David; 2 Samuel 1:19-27), wending through Homer’s Iliad, traveling through the Latin poets of Antiquity (Virgil, Horace, Ovid, Martial, Juvenal), before visiting the Near East (Rumi and Sa`di) and the Middle Ages (Dante and Hafiz of Shiraz). So roughly 2500 years of human history, and literature, occupy the first forty pages. The Renaissance and the Early Modern periods (Michelangelo, Spenser, Drayton, Marlowe, Shakespeare, Barnfield, John Wilmot) occupy the next twenty; and so, on page 60, we are already at the nineteenth century with Lord Byron, von Platen, Alfred, Lord Tennyson, Whitman, and Verlaine and Rimbaud. The rest of the book (well over half) deals with the entire twentieth century, plus the beginnings of the twenty-first, ranging from T. S. Eliot, Roger Casement, Tennessee Williams, James Broughton, Essex Hemphill, to Hal Duncan, Brane Mozetič, Slava Mogutin, and Stephen S. Mills. I should stress that this slender volume is not an anthology of Gay poetry: Gunn occasionally quotes brief excerpts from the poetry he discusses, but rather each entry (as the subtitle notes) is a personal reflection about the context for each poet in his Gay canon, explaining what we know of each poet’s Gay life, and which poems have implicit or explicit Gay readings. Gunn provides editions and/or English translations for the poems he examines; if multiple versions exist, he discusses their merits and then proposes his favorite. When available and appropriate, he also provides supplementary materials such as recent biographies and/or critical works for each poet. Closing the book is a short essay on the vagaries of translation (especially in regards to poetry), a full bibliography of all cited works and editions, and an index. Lest you think that this volume is simply a catalogue of essays with pedantic, dry-as-dust commentary on the symbolism of rosebuds, I note that Gunn is not above dishing a little bit, for example remarking that when Lord Byron’s body was exhumed in 1938 it “was still in an excellent state of preservation” which provoked the discovery that “his sexual organ showed `quite abnormal development’” whereas Verlaine’s member was “short and not very voluminous” according to court records of the time. Moreover, Gunn is not shy about sharing personal details, such as his regret at not hooking up with Allen Ginsburg when they met at the 1980 MLA Convention. Literature is a conversation. Every poet writes in response to whoever has written before him; when readers read their poetry, they in turn continue the dialogue. Gunn engaged with each of the poets in his final work, at turns agreeing, disputing, approving or not of their poems; by so doing he encourages us to do the same.